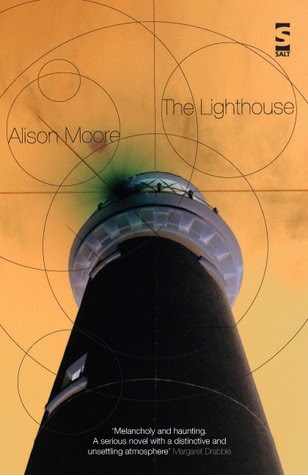 Having heard Alison Moore read at Plymouth International Book Festival 2013, I bought her Booker shortlisted novel, The Lighthouse. It's taken me since November to have time to read this (the woes of a reviewer with too many books). The Lighthouse chronicles the journey of Futh, a middle aged man on a walking tour in Germany following the break up of his marriage. In fact, the trip is almost secondary to the story, which recounts key moments in Futh's life as he grew up, with a particular focus on his mother leaving. Alongside this narrative is that of Ester and Bernard, a couple who run the hotel Futh begins and ends his trip in. On his first visit, he inexplicably offends Bernard and for the rest of the book, we are anticipating what will happen on his return. Moore is expert at building tension. Futh clings to a small silver lighthouse which used to encase his mother's perfume until it broke the day before she left him and his father. He returns to this afternoon several times, each with a slight variation on the telling. This is what makes the book so melancholy; we know he cannot let go of his past. We wonder, as he does, what will happen when he returns to England and must begin a new chapter of his life alone. The atmosphere of Moore's novel recalled Michael Frayn's Spies as the story is made up of misunderstandings and wrong turns, infidelities, unhappiness, and unanswered questions. It's a literature lover's book in that Moore's method of storytelling is subtle and beautifully crafted. Based on a misunderstanding which has terrible consequences, there is an inevitability to the ending of this novel, but Moore keeps the reader hanging, refusing to provide us with resolution, as only the most competent writers can.